Miguel De Pedro returns with his latest release; and as usual it’s impossible to tell before hitting ‘play’ as to what will flow from the speakers. The album title pretty much sums it all up as whole, with an electronic mash up sounds that have that emulate the pompousness of Toto and Doobie Brothers, with a flair for emotive electronica such as The Orb; with a cheeky glint in his eye and tongue firmly pressed in his cheek, as always. There has always been a child-like simplicity to Kid606’s work that should grate and irritate, but feels perfectly natural and is obviously intentional. Somewhere deep within the playschool harmonies lies a base level grasp of real emotion that never fails to materialise and hit the listener at their core, awakening feelings that have been dormant since infancy. Musically speaking this album differs little from ‘Lost in the Game’, which tapped into somewhat darker territory emotionally speaking. But as tracks like ‘Happiness is a Warm Kitten’ and ‘Taco Time’ convey, this release comes from an altogether more joyful disposition and it’s almost impossible not to feel uplifted by this album as a whole. 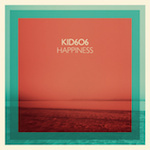 Over 11 tracks, Kid606 takes us on a nostalgic journey that embraces all those fleeting moments that are all too easy to take for granted. ‘Happiness’ is one of those releases that you can imagine listening to when you hit the twilight of your years and remembering the sunnier moments of your existence; appreciating the fact you had this chance at life and it wasn’t necessarily all bad.